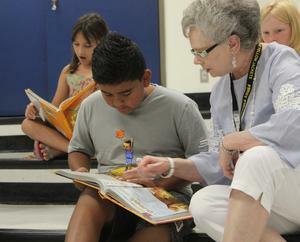 There’s a volunteer voice that often blends in with those of students during music class at Gerard Elementary School. Marilyn King has combined her love of music and work with children for more than ten years as a participant in the Cleburne ISD Volunteers In Public Schools program. The District Inservice for new and returning members of VIPS will be held Thursday at 9 a.m. in the CISD Central Offices, 505 N. Ridgeway. The session will provide an overview of the VIPS program and mini-sessions with campus principals in preparation for the new school year, and a new year of volunteer service. In 2017-18, participants of VIPS contributed more than 12,000 hours to CISD in their work with students and staff. King will be starting her eleventh year as a volunteer with Cleburne schools. She is not your typical VIPS participant, as she provides an extra set of hands to Gerard music teacher Hazel Bell--who is also her sister. King’s efforts to harmonize with her sister’s work with students began at Adams Elementary, and now at Gerard, where Bell creates musical magic with the Grizzlies. And for Bell and her volunteer sibling—that’s music. According to King, music was a big part of their lives growing up. But for King, volunteering isn’t just about the melody. For more information on the Cleburne ISD volunteer program, contact Lisa Magers, director of community relations, 817-202-1127 or lmagers@c-isd.com. Volunteers In Public Schools member Marilyn King follows the words, and notes, along with a class of fourth graders during music period at Gerard Elementary. Cleburne ISD’s District Inservice for new and returning volunteers will be held Thursday at 9 a.m. at the Central Offices Building.